Okay I know what you're all thinking. 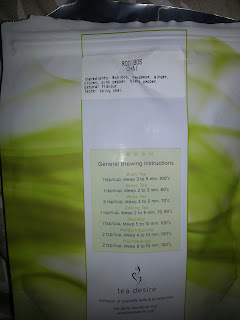 I've reviewed this tea before as a sample! Which is true. But I, in my silliness, did not prepare it as one should a chai tea. This time I did. I used three full scoops of the loose leaf tea into a tea bag, plopped it into a double-boiler with milk, let it steep for quite a few minutes on medium. Added three sticks of honey (I would have preferred my agave, you need less of it, but the honey was on hand). Ran myself a nice bath, and then soaked for a bit with the lovely tea. And man, is this lovely. If you find a regular chai to be too much, then this will be nice for you. It still has that chai flavor I personally love, but it's slightly more laid back and smooth.